XKSS for sale at Barrett-Jackson Scottsdale auction, January 15-19. The XKSS was conceived as a "street car" to compete in production class racing. 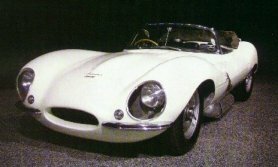 XKSS 719, the seventh in line, began life as a production D-Type, but before completion was selected for conversion to a special "road-going" model called the XKSS. XKD 572 was re-allocated to chassis number XKSS 719 - The body and engine numbers remained unchanged (H 2072 and E2082-9 respectively) The car was delivered by Jaguar Midwest Distributors Inc., Indianapolis, Indiana to Mr. James H. Grove of St Louis, MO during the latter part of July 1957. At the time of delivery, as documented from Jaguar Archives, the body was painted white with black leather upholstery and a black soft top. Grove first raced XKSS 719 in September of 1957. Early in 1958 he installed a Hi-Torque limited slip differential to improve handling and changed the rear end ratio to 3.92. His racing carrer with XKSS 719 was apparently quite successful as indicated in a letter to "Lofty" England, Jaguar Racing Director, January 21, 1959, in which he talks of winning a nice collection of silverware. In late January of 1959, Grove sold the car to his friend Jerry Hardesty also of St. Louis. Not too much is known of the history or use that Mr. Hardesty made of XKSS 719. He apparently overhauled the engine and painted the car black with red interior. In late 1963, Hardesty sold the car to Steven J. Earle of Los Angeles, California. It is not known whether he campaigned XKSS 719. On October 2, 1969, Earle sold the car to The Vintage Car Store, Inc., Nyack, NY, who subsequently resold it on December 13, 1969 to Robert D. N. Danny of Middlesex, England. The car was shipped back to England, by Mr. Danny, arriving there on February 19, 1970. XK SS 719 may have been raced during Danny's ownership, as we know that the engine was completely rebuilt by Mr Hodge, an employee of Jaguar, in 1973. Sometime after 1973, probably in early 1975, Danny sold XKSS 719 to Clive Jarman of London. Beginning in May of 1976, Lynx Engineering, of Sussex undertook a complete restoration of the car for Mr. Jarman. The car was reupholstered in Connolly black leather and repainted in British racing green. The restoration was completed in July 1977, Upon completion of restoration, Jarman sold XKSS 719 to Bob Baker of Omaha, Nebraska. Baker immediately shipped the car to the United States and through correspondence we know it had arrived prior to August 31, 1977. Little else is known of Baker's use of the car. In June of 1982, Baker sold XK SS719 to William R Tracy of Alexandria, Virginia. Bill Tracy is a well-known Jaguar enthusiast, used XK SS 719 for personal pleasure and in car shows in and around the Washington D.C. area. On August 31, 1985, Tracy sold XKSS 719 to Norb F. Schaefer Jr. of Indianapolis, Indiana. Mr. Schaeffer, an attorney by profession, was an avid car collector with a particular passion for the Jaguar marque. He participated in a number of vintage race events on both the East and West Coast, campaigning his XK140 Coupe & E-Type roadster Jaguars along with XKSS 719. Mr. Schaffer's fondness for XKSS 719 is evidenced by correspondence declining an offer of "a substantial amount of money". In June 1999, a complete restoration of XKSS 719 was started, with the engine work performed by noted specialists, Phil Reilly Restorations. The car was finally completed in December 2001. This XKSS comes complete with all restoration documentation and correspondence dating back to 1957.